Piercing Pagoda is giving away over $20,000 in prizes this season. Play the Fall SMS Instant Win Game 2017 online or by texting STYLE to 66422 and you could win up to $1,000 in Piercing Pagoda digital gift cards. Over 3,000 winners! Piercing Pagoda Fall SMS Instant Win is open only to legal residents of the 50 United States and District of Columbia who are at least 18 years old or older at the time of entry. Void in Guam, the U.S. Virgin Islands, and other U.S. territories and possessions and where prohibited by law. The Instant Win Game begins on September 18, 2017 at 12:00 a.m. ET and ends on October 29, 2017 at 11:59 p.m. ET. Visit piercingpagoda.promo.eprize.com/fall17 to complete and submit the registration form. You will automatically advance to the Instant Win Game page and receive one Instant Win Game play for that Weekly Phase. Once on the Instant Win Game page, follow the instructions to play the Instant Win Game. Alternatively, you may text WIN to the short code 66422. Limit one Online Entry or Text Entry, per person, per household, per Weekly Phase during the Instant Win Game. There will be 3,494 random, computer-generated winning times will be generated during the Promotion Period. 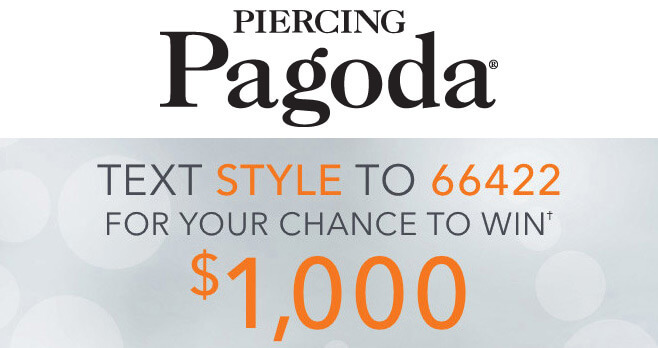 ONE (1) GRAND PRIZE: A $1,000 Piercing Pagoda digital gift card. FIVE HUNDRED FIFTY (550) FIRST PRIZES: A $25 Piercing Pagoda digital gift card. TWO THOUSAND NINE HUNDRED FORTY-THREE (2,943) SECOND PRIZES: A $5 Piercing Pagoda digital gift card. TOTAL ARV OF ALL PRIZES: $29,465. For a winner list, visit http://bit.ly/2fwcgK9. The winner list will be posted after winner confirmation is complete.